St Cuthbert’s, Pateley Bridge has a light ring of eight bells in D flat. The tenor weighs 4-1-24. These bells were installed by Taylor’s of Loughborough in the 1970′s and replaced a heavier ring of six. The present front bells are somewhat flighty and are not easy to ring. The treble and second do not have stays. They are rung up and then, being light, can be lowered over the top at hand stroke. These bells are usually left like this and can be quickly hauled up to the balance when they are needed for ringing. The Upper Nidderdale Bellringers are an enthusiastic group of ringers who cover all the ringing at both St Cuthbert’s, Pateley Bridge and St Chad’s, Middlesmoor. The bells at these two churches are very different from each other, the tenor at St Cuthbert’s being lighter than the treble at St Chad’s. Practices are every Tuesday from 7.30 to 9 pm at one or other of the two churches. 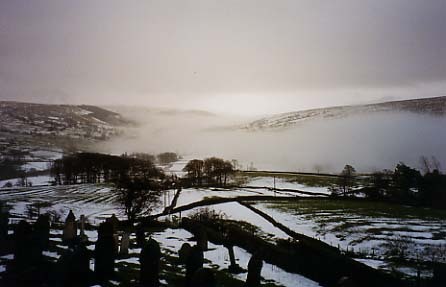 There is one practice each month in St Chad’s, Middlesmoor and the remaining practices are in St Cuthbert’s, Pateley Bridge. There is a slightly complicated rule for working out the venue. The Middlesmoor practice is held on the Tuesday preceding the fourth Sunday in the month. All the other practices are in Pateley Bridge. Sunday service ringing is from 10 – 10.30 am. On the fourth Sunday in the month the service ringing is in St Chad’s Middlesmoor. On all the other Sundays the ringing is in St Cuthbert’s Pateley Bridge but the second Sunday in each month is reserved for ringing touches (of Bob Doubles at present but we hope to progress). We are always delighted to welcome any visiting ringers to practices or for service ringing. NB the access to the Middlesmoor bells is at present via a vertical metal ladder. Some ringers are not happy with this access (and we are hoping to have a new staircase soon). Ladies are advised to wear trousers. For further information about bellringing please contact Chris or Lyn Robson on 01432 755235. St Chad’s, Middlesmoor has a delightful ring of six bells in F sharp. The tenor weighs 10 – 0 – 17. The bells were cast and installed in 1868 by Blews of Birmingham, renovated in 1912 by Gillett & Johnston ofCroyden andrefurbished in 2000 by the Whitechapel Bell Foundry (with considerable local help – see below for more details). 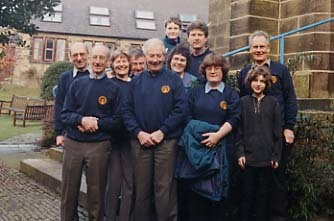 The Upper Nidderdale Bellringers are an enthusiastic group of ringers who cover all the ringing at both St Cuthbert’s, Pateley Bridge and St Chad’s, Middlesmoor. The bells at these two churches are very different from each other, the tenor at St Cuthbert’s being lighter than the treble at St Chad’s. Practices are every Tuesday from 7.30 to 9 pm at one or other of the two churches. There is one practice each month in St Chad’s, Middlesmoor and the remaining practices are in St Cuthbert’s, Pateley Bridge. There is a slightly complicated rule for working out the venue. The Middlesmoor practice is held on the Tuesday preceding the fourth Sunday in the month. All the other practices are in Pateley Bridge. Sunday service ringing is from 10 – 10.30 am. On the fourth Sunday in the month the service ringing is in St Chad’s Middlesmoor. On all the other Sundays the ringing is in St Cuthbert’s Pateley Bridge but the second Sunday in each month is reserved for ringing touches (of Bob Doubles at present but we hope to progress). We are always delighted to welcome any visiting ringers to practices or for service ringing. NB the access to the Middlesmoor bells is at present via a vertical metal ladder. Some ringers are not happy with this access (and we are hoping to have a new staircase soon). Ladies are advised to wear trousers. For further information about bellringing please contact Chris or Lyn Robson on 01432 755235. Treble Bell To call the folks to church in time we chime. 2nd Bell Peace on Earth, goodwill to men. 3rd Bell Be joyful in the Lord. 4th Bell Praise God on high. 5th Bell Love one another. Tenor Bell Remember the Sabbath day. In 1912 Gillett & Johnston ofCroydon rehung the six bells with completely new fittings. This was the only major overhaul of the bells until the complete refurbishment in the year 2000. By end of the twentieth century the bell fittings were in a sorry state and the bells were very difficult to ring. Refurbishment was long overdue. 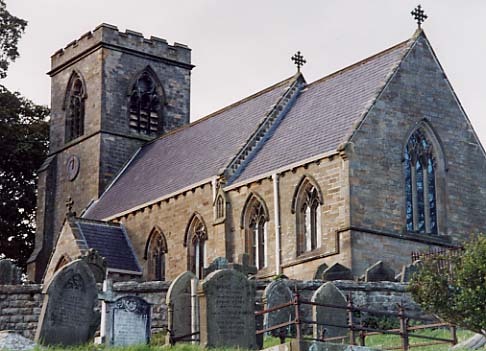 The refurbishment could not have been afforded without the unstinting voluntary help of North Yorkshire bell enthusiasts, local builder Martin Holmes and local ringers. The bells were dismantled (and later reinstalled) under the direction of John Hallett, president of the Cleveland and North Yorkshire branch of the Yorkshire Association of Change Ringers. They were then taken to the Whitechapel Bell Foundry where the clappers were turned, headstocks refitted, the bells tuned and proper bearings installed. In the meantime the wheels were refurbished and the new frame was built (both on a cost-of-materials-only basis). Local volunteers, under the direction of local builder (and ringer) Martin Holmes, prepared the tower for the new frame. The bells were removed in early August 2000 and were in ringing order by the end of October 2000. The local community is indebted to all those people who gave unstintingly of their time and expertise and made this refurbishment possible. The difference in the handling of the bells is astounding.